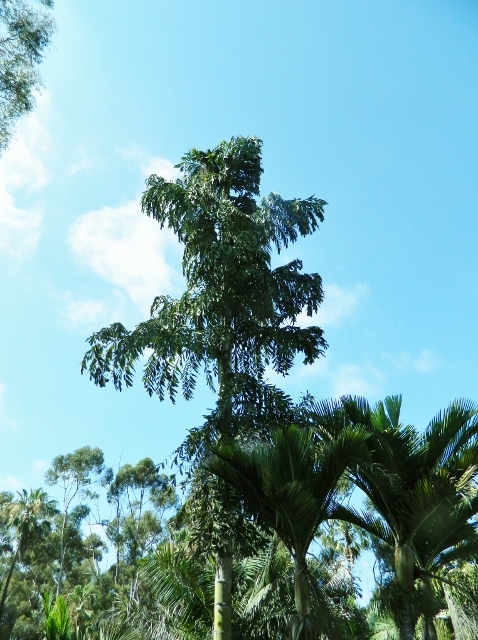 This article talks about the genus of Caryota, the Fishtail Palm. I'll discuss the three most common species, their culture and other unique things about this genus of large palm trees. Of note we usually have many types of Caryotas for sale at the nursery. Forty-one years ago, when I started growing palm trees, I was quite attracted to this genus of large tropical palms. Although I knew they would flower and then die, that didn't matter. I just had to have some to establish my overhead canopy. Back then, Caryota gigas was unknown to enthusiasts. So, I sought out a grower who had some smaller Caryota urens. 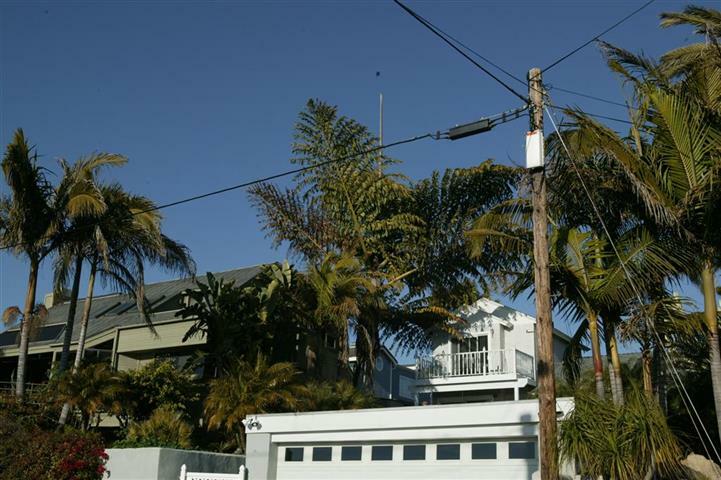 In the early 1980's it became the first Fishtail Palm in my garden. Later I got several more. I loved the size and design of the huge Caryota urens. I had also heard that they grew unbelievably fast. After purchasing my first 5 gallon, I was disappointed because it just stayed the same size the first year. I started thinking “they’re fast for everyone else except me”. Then, in the second year, the plant exploded. It grew aggressively for many years and got a trunk diameter of about 16 inches. Leaves were twelve feet long and the crown was huge. But, after about twenty-five years, it stayed true to its reputation. In about 2006 the dying process began. The first thing I noticed was the rather rapid browning of the lower leaves. About six months after this started, I notice the first flower spike at the top of the tree. This dying process took about five years until the tree appeared to be totally dead by 2011. My tallest Caryota urens reached a height of 85 feet. What a monster! It went through its fruiting and gave off tons of black and fertile seeds. Its fruiting flowers descended down the trunk - although the lowest flowers seemed not to produce fruit. My suspicion is that the leaf "death" was secondary to the trees stealing the nutrition from the leaves to supply the energy to form the flower spikes. All leaves eventually turned brown and dry. Remember that Caryotas are monocarpic, meaning that the fruiting trunk will die after blossoming. If it is a single trunk Caryota species, this means that the plant will die. If it a suckering (multi-trunk) species such as Caryota mitis, the flowering trunk will die and other trunks will continue and, over time flower and die. Below, I shall not discuss much about the taxonomy of the various species of Caryotas, but rather give some anecdotal information of interest about these great fishtail palms. Caryotas get their "fishtail" nickname because the leaflets are jagged or "chopped" appearing at the distal end, much like the tail of a fish. They are also a species with a bipinnate leaf. Seedlings do not have this latter characteristic, but over time it becomes apparent. "Bipinnate" means that the leaf has it's usual stem like other pinnate palms. It, however, has secondary branching pinna off of the primary stem of the leaf. Off this secondary pinna come the leaflets. The leaflets have the "fishtail" appearance. There are single trunk species like Caryota urens, C. gigas, C. rumphiana, and many others. There are suckering species like Caryota mitis. If climate permits, almost every palm enthusiast grows one type or another of Caryota. The majority of Caryota are single trunk species. Surprisingly, the one you will most often see for sale in home improvement centers is a suckering species, Caryota mitis. "Suckering" means that it normally produces multiple stems, new stems emerging near the base of the "mother" trunk. This is a smaller species, reaching typically ten to twenty feet in height and having trunks about four to six inches in diameter. It has been used as a house plant. Most of this present article deals with the single trunk species which are more popular among palm enthusiasts. Brown-tipping on only the exposed area of a C. urens leaflet that pierce through the shade cloth while opening. C. urens fruits. You wouldn't want to clean these without good rubber gloves. Caryota have flowers of both sexes so that one tree may produce large numbers of viable seeds. The seeds are covered with a thick coat of brown or near black fruit. When collecting seeds that have fallen, avoid direct contact of the fruit with your skin. It’s irritating crystals will make you crawl with discomfort. Germination can be accomplished outdoors. With fruiting trees, it is commonplace for fallen seeds to germinate on the garden floor. I found a good way to notice if your tree is about to flower is to watch the color and quality of the existing leaves. The older, lower leaves on a tree that is about to blossom will suddenly turn a brownish-green and not look right. That phenomena may continue in an ascending fashion up the trunk for several more leaves. Then you notice the emergence of the flower. If a tree flowers, this is not a guarantee that viable seeds will form. It takes the right timing and proximity of the male and female flowers to create fertile seeds. As the male flowers end maturity, you might find that they create a rainstorm of flower debris below the tree. These will carpet the ground with yellow colored flower parts. During it’s peak, it is almost musical to hear the continual drop of flowers. Later, when the seeds start to drop, it’s like a hailstorm at times. Once your Caryota urens begins to flower, you have about five years of flowering before the tree will look so poor that you will want to have it removed. Be aware that the trunk of Caryotas is very hard, and tree climbers spikes may have difficulty entering the tissue of the trunk. Also, understand that the removal of flowers is difficult because of the weight of the entire flower. Removal of the flowers does not prolong the life of the tree. Because single trunk Fishtail Palms tend to be tall, they are subject to wind forces. It has been known that strong wind can blow them over. It's not common, but can occur. Multiple decades ago, I first heard about Caryotas suddenly falling over. Then I heard more stories here and there. I confirmed this phenomena once while I was talking with the late and longtime I.P.S. member Jim Specht. He told me that one morning after a very windy storm, he went outside to find that two of his mature Caryota urens had fallen over. One hit the neighbor to the left, one hit the neighbor to the right. Fortunately, no one was injured and there was minor damage to his neighbor's fences. I would surmise that this is the result of an extremely tall plant with relatively superficial roots. The important thing is to be aware that it can happen. Caryota urens in it's terminal life after blossoming. Caryota urens seems to be the vertically fastest growing of all the Fishtail Palms. You can go from one gallon to a fifteen gallon plant easily in two years in the greenhouse. The latter plant can be way above the house in five years when planted out and properly maintained. Trunk diameter mature is 14 to 18 inches. Almost all specimens attain a height of nearly fifty feet or more. The trunk has a white, furry texture. If you scratch your initials through this fur, it'll be there for the life of the tree. Caryota gigas is a truly beautiful plant. However, it takes more time to get the vertical height when compared to C. urens. The beauty of it’s leaves and the dark, intriguing leaf bases are worth the wait. Also, it seems to put on more girth before it maximizes it’s height. Average height in CA is thirty feet. So, it's a shorter but much stouter palm with a very fat base and long, wide leaves. Leaves are fourteen feet long and usually twelve feet wide or more. By the way, Caryota gigas has been marketed in the past with such names as “Caryota Thai Mountain”, “Caryota obtusa”, or “Caryota King Kong”. From most growers, all such purchased plants are synonymous with what we now agree to call “Caryota gigas”. Undoubtedly, palm taxonomists will describe near Caryota species in the future. Caryota mitis, mentioned above, is a suckering, much shorter palm. It can have five, ten or even two dozen trunks. The trunks are typically four to six inches thick and eventual height is ten to twenty feet. It is much slower growing that the single trunk species. There are many other species of Caryotas that I won't discuss here. Caryota gigas, juvenile but still showing bipinnate leaf. Although Caryotas are not the tallest palms in the world, many species definitely tower overhead and some may get taller than eighty feet. As a rough estimate, figure your Caryota urens will get to fifty feet or more, Caryota gigas to thirty feet and C. mitis to fifteen feet, sometimes taller depending on where you live. Caryota rumphiana, cummingii, and C. no are shorter than the aforementioned species. 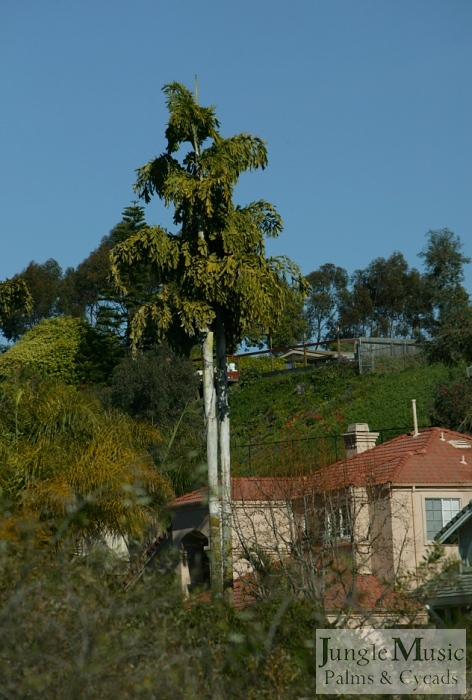 An interesting observation is that, when Caryota urens is grown in more tropical areas, it does not attain the height we see in Southern California. I have seen many C. urens rapidly come to blossom in Hawaii with a height of only about twenty feet. Also, they are not nearly as beautiful as plants grown here. This seems to suggest that this species likes somewhat cool weather. In terms of culture, good soil and ample nutrition help the plants reach their predicted maximum height. Poor culture may result in a runty plant. What Happens to the Tree When It Blossoms? When blossoming begins, the tree does not gain any more height and does not put out any new leaves. The older, lower leaves turn brown and hang downwards. They will remain as such for years, only falling off by pruning or severe wind. It has also been observed that large Caryotas that have been dug and moved will promptly go into premature blossom without attaining their anticipated height. It seems that digging triggers the plant into the reproductive phase of it’s life. Given the fact that Caryotas typically grow so rapidly, a consumer would be ill-advised to purchase a field grown single trunk Caryota. As they are so fast growing, smaller plants such as a 15 gallon or 24 inch box will give you a large tree in no time. 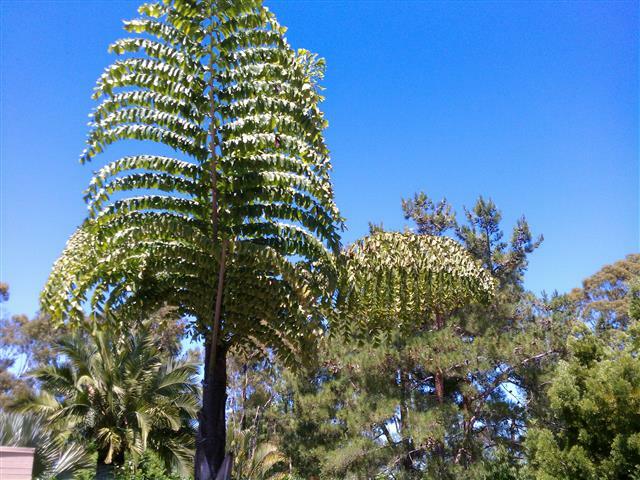 A local hotel in San Diego purchased about eight field dug Caryota urens. At the time, they were unaware that digging can trigger the demise of the tree. They were planted all these dug palms in the hotel entryway but within a year or two, all blossomed and died. 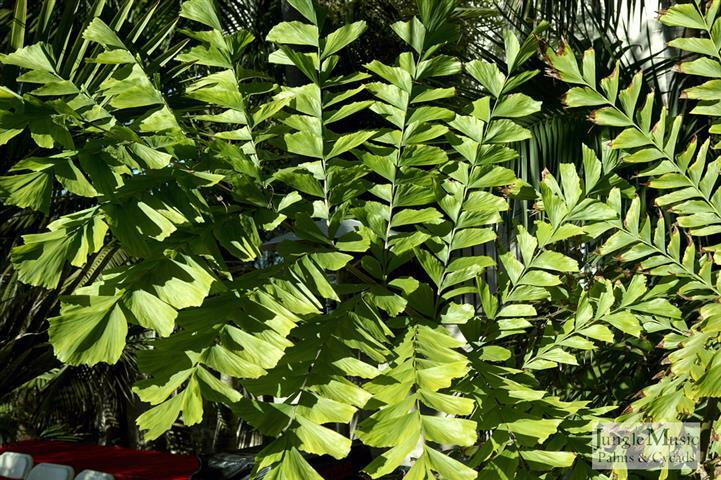 The bottom line is not to buy any field grown and dug Fishtail Palm. Leaflet tip burning is a phenomena that you'll see on Caryotas. It seems to be most apparent on Caryota urens but all Fishtails can show it. It's most commonly seen in container grown plants. It happens when plants are under-watered and in full sun. Also, the containers (black) getting hot from sun may play a role. It's less apparent in the garden and can usually be remedied by giving the plant extra water. Because of this problem, I usually do not recommend Fishtails as a container grown plant for the home. Also, super hot and bright sun can burn Fishtail leaves, especially far inland. The photo to the left shows how a beautiful C. urens leaf pierced through the shade cloth, leaving the top half with the brown-tipping and the bottom half beautiful. The exposed upper leaf shows the burn. Caryotas urens, ochlandra and gigas are quite easy to grow along the Coastal strip. It appears that C. gigas will tolerate temperatures to the mid to low twenties F. but isn't quite as cold tolerant as C. urens. I had a customer who had severe burn on his gigas at 22 degrees but the plant recovered. C. urens and ochlandra will survive more cold - into the low twenties F. or even the upper teens. Caryota ochlandra is very similar to C. urens but shorter, and has dark colored webbing at the leaf base and on the trunk. Caryota no, mitis, cummingii and rumphiana are more sensitive to cold. Caryota mitis is, at best, at 25 to 26 degree plant. My Caryota no has now flowered and died. But, it got to a height of thirty-five feet. It took temperatures in the mid-thirties F. I'd predict it would have trouble below a freeze. Caryota ophiopellis and zebrina seem to prefer more tropical temperatures and definitely do not tolerate freezes. They both have interesting banding on the petiole and rachis and are worth the try if you live in a great area. Because they are so fast growing, Caryotas do need an ample amount of water and fertilizer. Organics are fine. If you use a chemical fertilizer use a slow release preparation that has micro's and is formulated "for tropical plants". You'll find most species are very easy to grow. If you live in a hot inland area, figure you definitely have to give Fishtails lots of waters or you palm will look scrappy with brown tips. Also, remember to give them ample room away from the foundation of your house and anticipate the shade they will create. They are the perfect palm to give your garden an overhead canopy with it’s resulting protection from cold for other under story species. No other palm in our locality surpasses the speed of growth of Caryota urens. I would estimate that the anticipated life span from germination to browning of the leaves of Caryota urens to be twenty to twenty five years. Fifteen years would be a short life. Caryota gigas has a shorter life span here in California. I'd estimate fifteen years at best before they flower. Remember, once you see flowers on Fishtails, you still can enjoy the tree for a few more years while it's flowering. Caryota mitis doesn't die when one stem flowers. The other stems live perpetually until they blossom and then new suckers are formed. The picture to the right shows a trunk with of a Caryota urens. Note the light color. It also has a minimally furry, off white surface. If you scratch in your initials on the trunk, they'll be there forever. So, try to keep your trunk pristine and pretty when working around it. Sometimes you'll see vertical cracks or fissures in the trunks as the tree and trunk get larger, especially if given extra water and fertilizer. You'll note this on the picture to the right. I think this may be a result of very rapid growth. In any case, I have never known these to be a nidus for infection or rot. So, don't seal them up. Most likely it won't be anything other than a cosmetic issue. A special comment has to be made about Caryota no. This species looks like a huge fern in the sky. I will never forget some mature specimens I saw in Bogor Botanical Gardens in Java. I thought I had gone to "palm heaven". Their huge lacy leaves made the most beautiful silhouette in the sky. If you live in a good area, please give Caryota no a try. And, have fun with all the Caryotas.